I can’t get flashing over USB to work. How do I update to the latest beta release? How do I use the latest bleeding edge version? Does ESPHome support [this device/feature]? I have a question… How can I contact you? ESPHome supports (most of) Home Assistant’s YAML configuration directives like !include, !secret. So you can store all your secret WiFi passwords and so on in a file called secrets.yaml within the directory where the configuration file is. For even more configuration templating, take a look at Substitutions. You can always find the source ESPHome generates under <NODE_NAME>/src/main.cpp. It’s even possible to edit anything outside of the AUTO GENERATED CODE BEGIN/END lines for creating custom sensors. Use substitutions to reduce repetition in your configuration files. ESPHome depends on the operating system the tool is running on to recognize the ESP. This can sometimes fail. Common causes are that you did not install the drivers (see note below) or you are trying to upload from a Docker container and did not mount the ESP device into your container using --device=/dev/ttyUSB0. 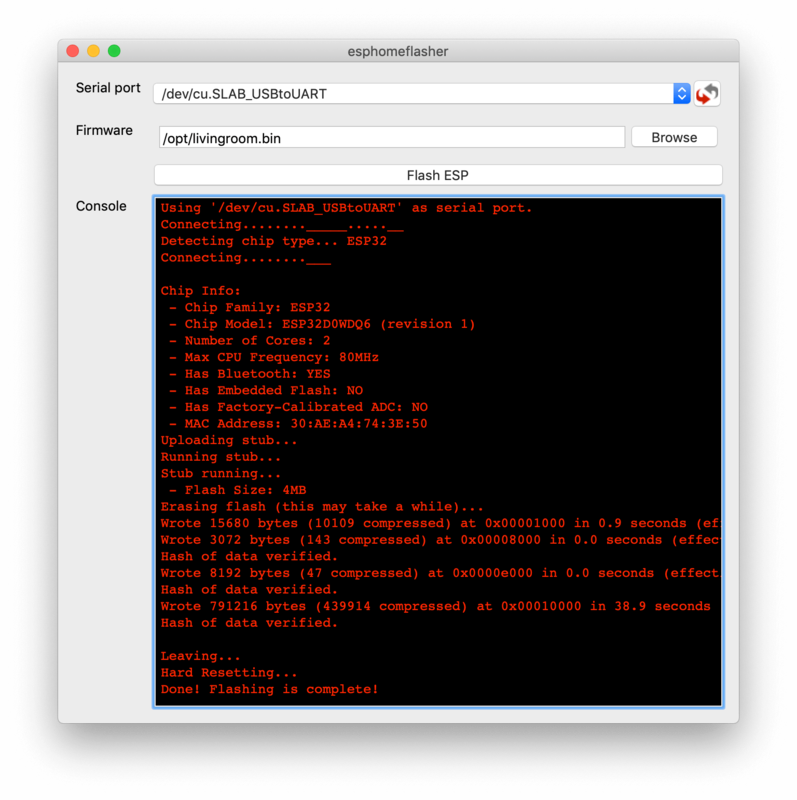 Starting with ESPHome 1.9.0, the ESPHome suite provides esphome-flasher, a tool to flash ESPs over USB. First, you need to get the firmware file to flash. For Hass.io add-on based installs you can use the COMPILE button (click the overflow icon with the three dots) and then press Download Binary. For command line based installs you can access the file under <CONFIG_DIR>/<NODE_NAME>/.pioenvs/<NODE_NAME>/firmware.bin. Then, install esphome-flasher by going to the releases page and downloading one of the pre-compiled binaries. Open up the application and select the serial port you want to flash to (on windows you can use the “device manager” to check if it’s the right one). Select the firmware binary and finally press “Flash ESP”. If you’re just seeing Connecting....____.... on the screen and the flashing fails, that might be a sign that the ESP is defect or cannot be programmed. Please double check the UART wires are connected correctly if flashing using a USB to UART bridge. For some devices you need to keep pressing the BOOT button until flashing has begun (ie. Geekcreit DOIT ESP32 DEVKIT V1). If you’re having WiFi problems: See My node keeps reconnecting randomly. Enable verbose logs in the logger: section. Still an error? Please file a bug report over in the ESPHome issue tracker. I will take a look at it as soon as I can. Thanks! First of all, thank you very much to everybody submitting issue reports! While I try to test ESPHome/yaml as much as I can using my own hardware, I don’t own every single device type and mostly only do tests with my own home automation system. When doing some changes in the core, it can quickly happen that something somewhere breaks. Issue reports are a great way for me to track and (hopefully) fix issues, so thank you! Just writing “X doesn’t work” or “X gives bug” is not helpful!!! Seriously, how do you expect help given just that information? A snippet of the code/configuration file used is always great to reproduce this issue. Please read How to create a Minimal, Complete, and Verifiable example. If it’s an i2c or hardware communication issue please also try setting the log level to VERY_VERBOSE as it provides helpful information about what is going on. Please also include what you’ve already tried and didn’t work as that can help us track down the issue. And for Hass.io, you will see a “ESPHome Beta” Add-On for the beta channel. In Hass.io: In the ESPHome add-on repository there’s also a second add-on called ESPHome Dev. Install that and stop the stable version (both can’t run at the same time without port collisions). docker build -t esphome-dev -f docker/Dockerfile . If it’s not in the docs, it’s probably sadly not supported. However, I’m always trying to add support for new features, so feel free to create a feature request in the ESPHome feature request tracker. Thanks! ESPHome issue and feature request issue trackers. Preferably only for issues and feature requests. Jep, that’s a known issue. However, it seems to be very low-level and I don’t really know how to solve it. I’m working on possible workarounds for the issue but currently I do not have a real solution. Give your ESP a static IP. Set the power_save_mode to light in the wifi: config (only helps in some cases, in other it can make things works). See Power Save Mode. The issue seems to be happen with cheap boards more frequently. Especially the “cheap” NodeMCU boards from eBay sometimes have quite bad antennas. mDNS might not work if your Home Assistant server and your ESPHome nodes are on different subnets. If your router supports Avahi, you are able to get mDNS working over different subnets. Enable Avahi on both subnets. Enable UDP traffic from ESPHome node’s subnet to 224.0.0.251/32 on port 5353.